​​ DALLAS - A rental community in the $200 million West Love development near Dallas' Love Field will begin construction in September 2016. Irving-based JPI plans to build hundreds of apartments in the project on Mockingbird Ln. at Maple Ave. The first phase will include almost 370 units. Construction is already underway in the 35-acre West Love project on two hotels—Aloft and Element—that will total 244 rooms. The $49 million hotel project opens next year. And developer KDC is seeking tenants for a 150,000 to 200,000-sf office building it plans to build next to the hotels and apartments. A shopping center along Mockingbird rounds out the development. 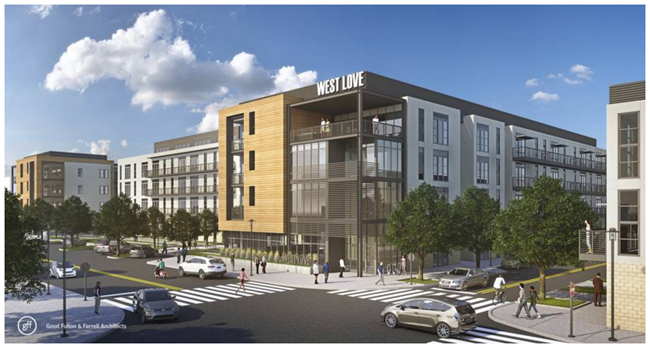 "JPI is our partner on the multifamily component," said Jorge Ramirez, partner of Highridge Partners, which put together the West Love project. "We have recently started utility construction in support of the apartments and expect to begin building construction in 30 to 45 days from now."